Cantemo Portal ensures easy administration of everything within the system. Our customers often need to allow access to media files to a wide range of employees across the company, and indeed even their own customers. Naturally, being able to give them easy access makes the process of sharing, editing, and distributing media content much simpler. However, at the same time, it is important to ensure the right people only get access to the right content, at the right stage of the editing process. Cantemo Portal™ enables you to setup very specific rights management, depending on the individual user or user groups. This can be done either by entering this information manually into Cantemo Portal, or by connecting it to your existing internal directory system and using the same users and group credentials within Portal. Cantemo Portal gives you an overview of specific activities and jobs within the system. You can can keep an eye on the progress of jobs and transfers in real-time, and take any necessary actions. Choose how much information you need to see for system jobs, archive jobs, and transfers, both in and out the Portal system. Being able to manage your transcoders and transcode profiles means you can ensure all of your media files will be transcoded into the right format at the right time. 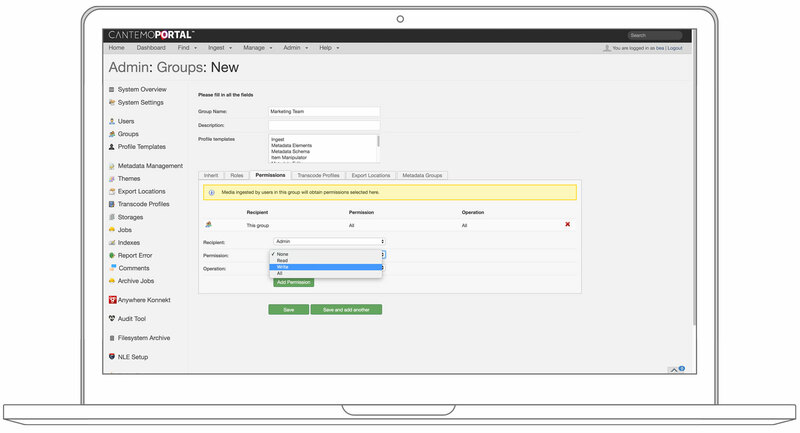 Define new transcode profiles, and associate them to specific transcoder pools, either the internal Portal transcoder, or external third-party transcoders. Read more here. By defining re-usable export areas for different groups, assets and metadata can be manually or automatically exported ensuring content is fit for distribution. Portal takes care of the complexity of this workflow, so users can focus on their own tasks. Read more here. 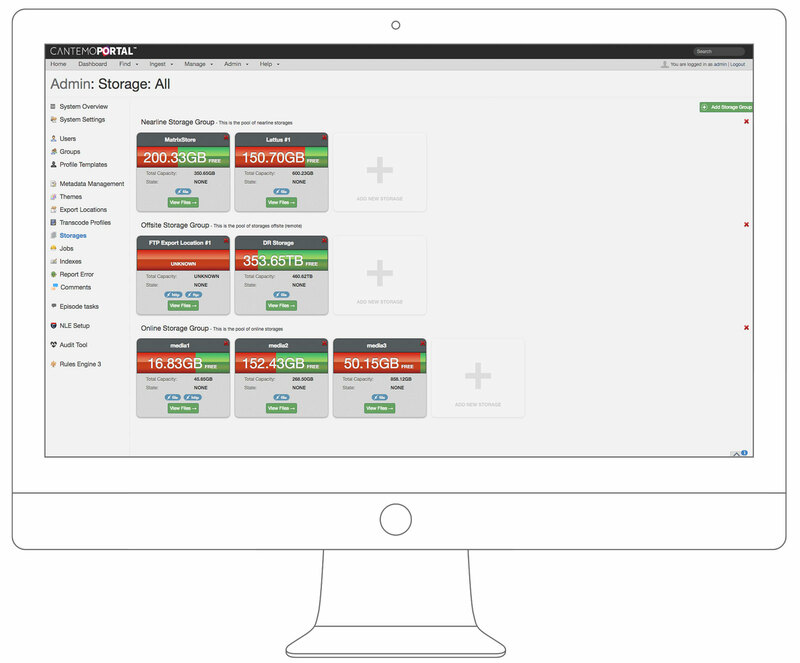 Cantemo Portal gives you an overview of your entire storage infrastructure, making it easy to manage files, and the distribution of them within your storage solution. Read more here. Portal comes with its own log report generator. This admin tool allows simplified gathering of important information to be used when troubleshooting the system, packages all the information in a zip container, and makes it available for sending back to the support team – all through web interface. 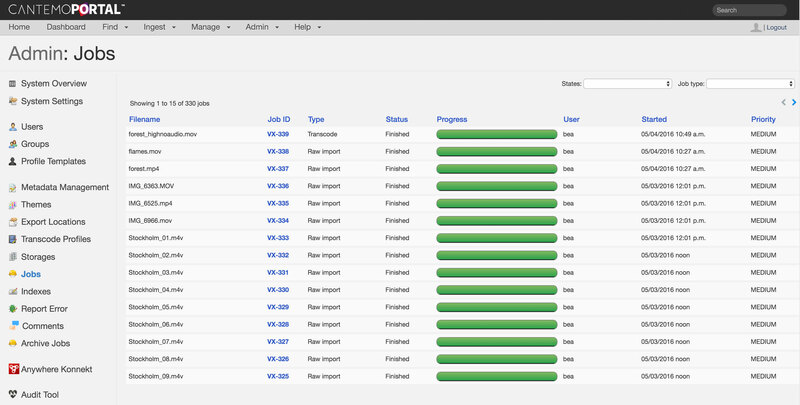 No need to look for logs in the backend, and manually extract relevant parts.